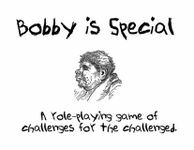 "Bobby is Special" is a role-playing game about people suffering from mental retardation. It is a game of challenges for the challenged. If you've felt the need to role-play a character who is special, this game is for you. You are Bobby. Or Suzy. Or Timmy or Sally or Mikey or Betty or Johnny. You are special.